The artistic journey really needs to be unique on the verge of getting lost. You do not get anywhere new by following someone else. In 2018 it seems like everything has been said and done already. It would seem that creative repetition and artistic journey overlaps are unavoidable. Even though similar brush strokes might have been completed before it is still the first time for me. There are only so many ways that one can dip the hairy end of a brush in the paints and transfer those pigments to a canvas. As I progressed from photographic realism when I started my trip with Mario Airomi in the late 1960's to what I do today, the inspiration has remained unchanged - the natural world. I do not get the same zing from anything person-made. 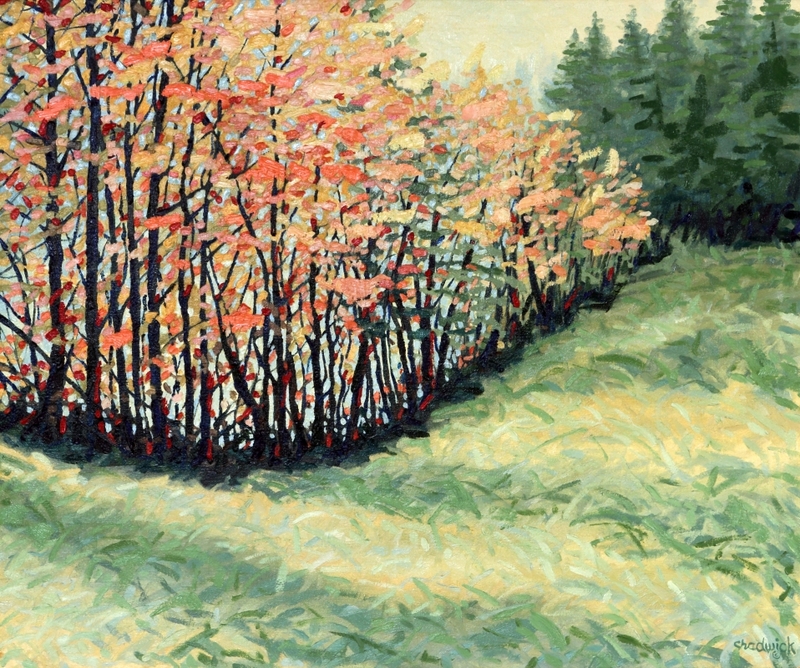 My style has indeed loosened up but the shapes, colours, values and texture I paint on the canvas can be found in nature if you look hard enough. 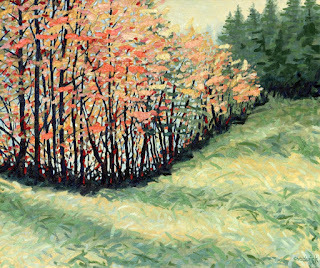 Those same characteristics can also be found in those early canvases at the start of my journey. 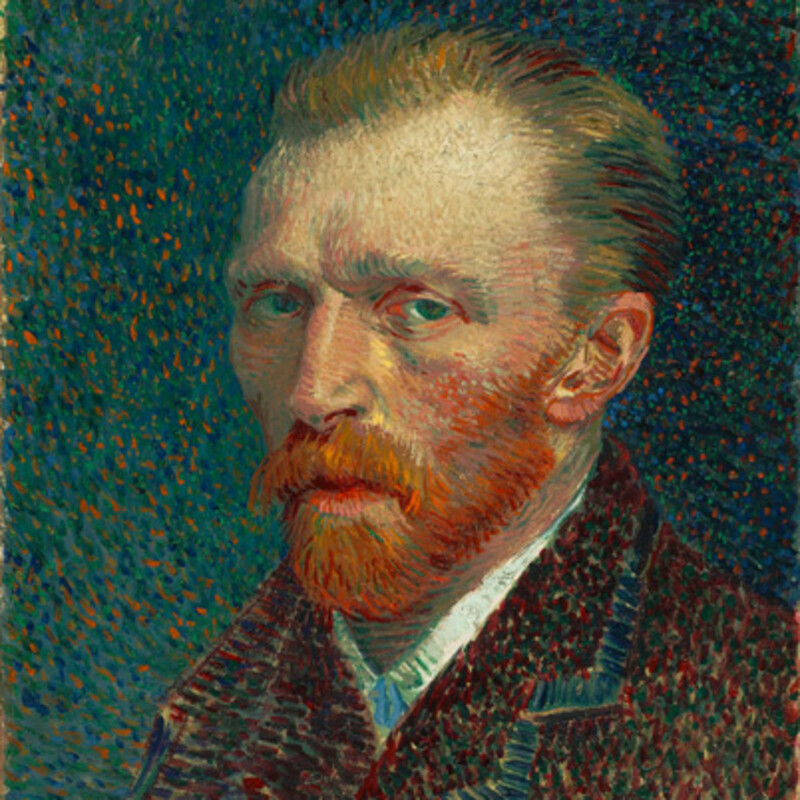 Today Vincent Van Gogh would have become a five score plus senior citizen born 165 years ago in 1853. He started his artistic journey late at the age of 27 or 28. He painted an average of two paintings a week completing almost 900 canvases by the time he died at the age of 37 in 1890. He also left behind 1100 drawings on paper. He never knew how many lives he would touch in a good way. I try very hard to paint like "me" but for sure there are canvases where our journeys look like they overlapped although I am not Vincent or Tom for that matter. My journey still needs to be unique to me. I may not know where I am going but I am not lost either. 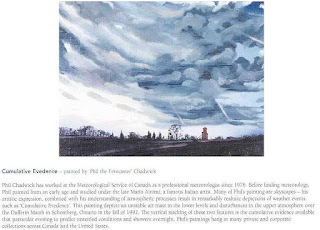 The painting above, #0588 "Downburst" from July 2002 is mid journey for me. It hangs in Vancouver now. My supporter really likes it but also has it on the secondary art market. 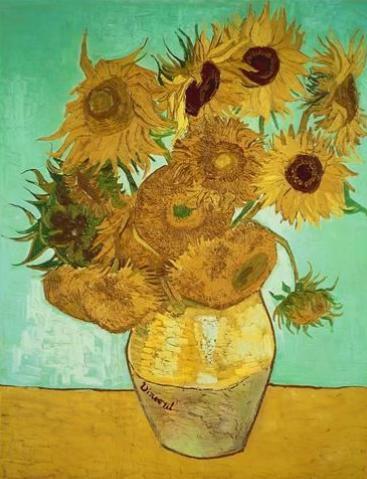 Some might see some Vincent influence in it. PS: I needed meteorology to support my artistic life style. There is weather every day... and I am really enjoying the ride! This painting was completed July 12, 1993. I keep an updated art record that is possibly unique in the world. Visual Basic is used to keep it current. Software I have written also keeps track of paintings that I have Blogged about and those published on Pixels. Without this coding I would quickly lose track of what has been published out of the 2078 paintings. This older painting got published today. Linda wanted a painting of chickens... These chickens were on the farm of the horse people near Aurora when I went to do the study for the painting of their horses which I completed as #0339 "A Little R and R". The birds were friendly as chickens go but at the moment, the rooster and hen were destined for the open field. Why? I have no answer for that just like when chicken cross the road. I used the cedar fence of the horse paddock to frame the chickens. They had personality and a purpose behind their stroll. Maybe they were going to the chicken dance. From August 1993... This tree brings back some great memories of some French River canoe trips and Restoule Provincial Park. 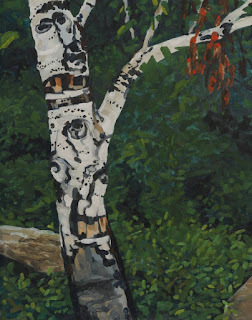 An old birch tree beside the camp site on the northeast shore of Shoal Lake, Restoule in August 1993. I had noticed this tree several times before because of the faces I see in it as well as the Yellow Bellied Sapsucker holes. The Newmarket North York, Registry Office, Main Street, Ontario as it appeared on November 18th, 1990. The afternoon sun cast long shadows as the family strolled and shopped on a beautiful Sunday afternoon. 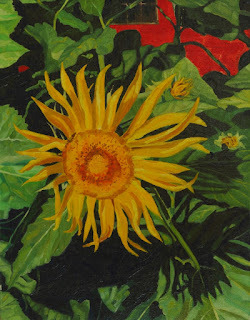 It is a very small painting but very detailed. I was always on the look out for something interesting to paint. In time these observations will be historic. 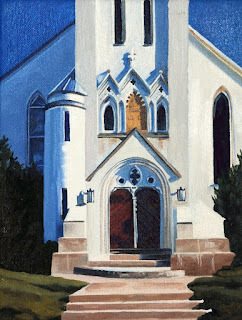 This is the partner painting to #0292 "The White Church". A church in Newmarket, Ontario as it appeared on November 18th, 1990. The church is on Main Street and located on the east side of the road. The afternoon sun illuminated it well as the family strolled and shopped on a beautiful Sunday afternoon. It is a very small painting but very detailed. 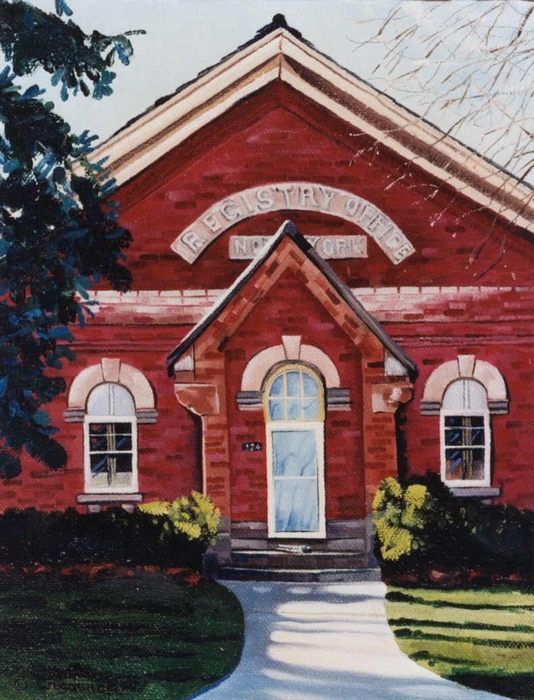 This is the partner painting to #0293 "The Registry Office". #0410 "B. C. (Before. Chadwick.)" This was done from a photo I took while Keith and I were walking an aging purebred black Labrador retriever Clay. It was a cool and cloudy November day but just right for walking the bush with a dog. We had no inkling that we would be living in that house starting in the spring of 1993. Funny how things work out! This property is on the west side of the 12th Concession of King Township just north of Hammertown and immediately south of Kennifick Lake. What evolved into the nature preserve of Watershed Farm at the very crest of the Oak Ridges Moraine has now been essentially consumed by the expansion of Toronto. At that time we boarded horses and had an apiary. We also planted thousands of trees to give nature a reason to return. From the summer of 1990.. This is a stratocumulus cloud deck in July 1990 - I was lying on my back in the backyard of our home on Western Avenue in Schomberg, Ontario. The view is toward the northwest with the clouds front lit by the morning sunshine. The gravity waves were the result of southerly winds blowing over the Oak Ridges Moraine and the remains of the nocturnal radiational inversion. The lines of cloud are too close together to be attributed to unstable cloud streets of stratocumulus. Continued daytime heating would raise the surface temperature to that required for surface based convection. At that point the cloud bases of the stratocumulus would be raised higher than their tops. This morning layer of stratocumulus would fizzle into clear air to be replaced with higher based cumulus clouds that would be much more widely scattered. There would of course be a line of cumulus organized along the Lake Ontario lake breeze that would push northward during the day. 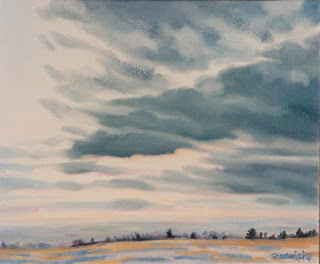 This line of cumulus would likely stay south of the crest of the Oak Ridges Moraine leaving Schomberg with less cloud. To deduce the afternoon weather one would need to diagnosis the stability of the air mass and the presence of any small pulses of energy known to meteorologists as short waves. For this I always resorted to tephigrams and the water vapour imagery. Thunderstorms would be possible in an unstable air mass with low level moisture and some lifting agent and trigger like a short wave. Weather is always fun. As a society we have lost the art of simply slowing down and taking the time to look up and enjoy the sky and the weather. The clouds have a story to tell. 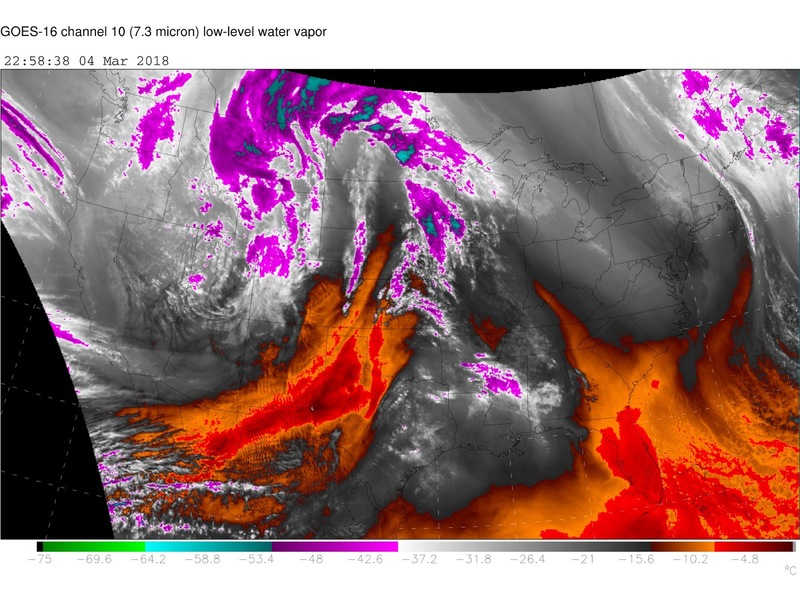 If one is a student of meteorology the cloud shapes reveal the moisture content and stability of the air mass as well as the winds blowing within that atmospheric frame of reference. 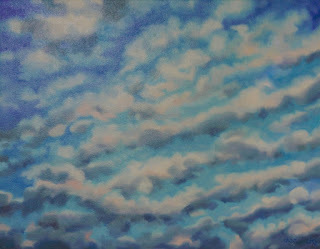 Otherwise you can simply enjoy the fascinating shapes and colours of the clouds. Both approaches are equally valid. #0385 "The Back Fifteen (Acres)"
At the edge of the swamp at the northwestern edge of Watershed Farm. Keith and I were on a walk with Clay the black Labrador in the fall of 1992. It was a misty and damp day and the scene caught my eye. We don't own forty acres so the best I can do is fifteen... Actually it was twenty-five acres but no one is counting. We would call this land home in the following year. 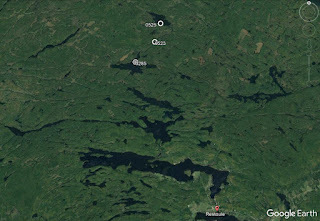 This was remarkably wild land for being so close to Toronto. We planted thousands of trees in an effort to give nature a refuge from the looming encroachments of the city to the south, west and east. A very puny title ... I'll explain... 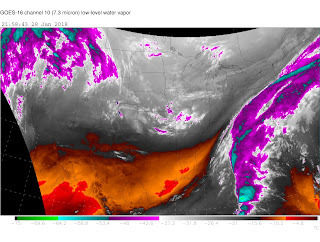 The main subject, the stratocumulus cloud deck, had some embedded cumulus which clearly indicated that the air mass in the lower levels was quite unstable but not unstable enough through a sufficient depth to produce showers. The deck of altocumulus on the northwestern horizon, was very probably associated with a disturbance in the upper atmosphere. Meteorologists call these short waves. The vertical stacking of these two features was the cumulative evidence available this particular evening to predict unsettled conditions overnight and the high probability of a shower. As I remember, that was exactly what happened... isn't science wonderful! This meteorology was observed by Keith and I as we walked in the Dufferin Marsh, Schomberg in the fall of 1992. The view is toward the north-northwest across the ShurGain Grain Elevator, Bishop's Mill. 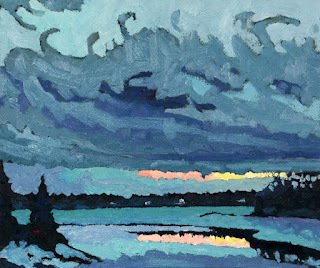 This painting was used as the official 2003 Environment Canada Christmas card when we used to do such things. #0285 "Home Base - Bass Lake"
This is the southeastern shore of the "Big" island (not Hawaii) on Bass Lake within Restoule Provincial Park. There are a lot of lakes with this name in Canada and goodness knows we did catch a lot of small and large mouth bass in those waters. Almost all of those fish returned to the lake. A favourite small mouth that was burnt in my memory emerged from the depths like a huge Polaris missile. One violent shake of its huge head sent the lure almost back into the canoe with Linda and I. This was a favourite site for a large campsite although Linda and I still preferred the small island further to the east. 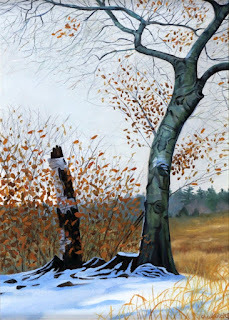 Every rock and tree in this painting were as I saw them. 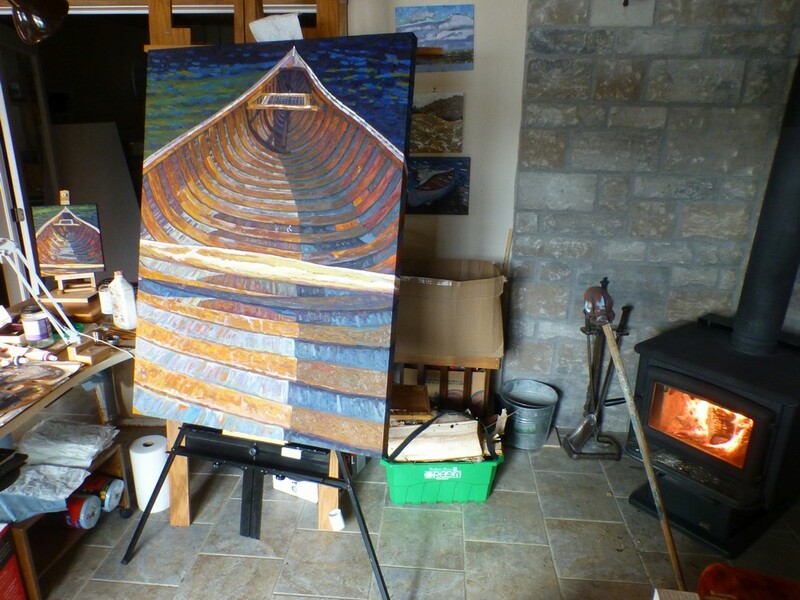 The fifteen foot fibreglass canoe is the first one that the family ever owned. We still have it although it does not see enough time in the water. My canoe buddy Paul and I were canoeing/camping/fishing in October 1990 and we were almost ready to go out for the day fishing. The lake was a bit chilly for all but very quick dip. Note the two Tim Horton mugs strapped on to Paul's day pack. We were very organized. This is from 1989... while working at the Ontario Weather Centre... I had returned to 12 hour shift work after a stint at Training Branch. I was able to return to my painting a bit more. 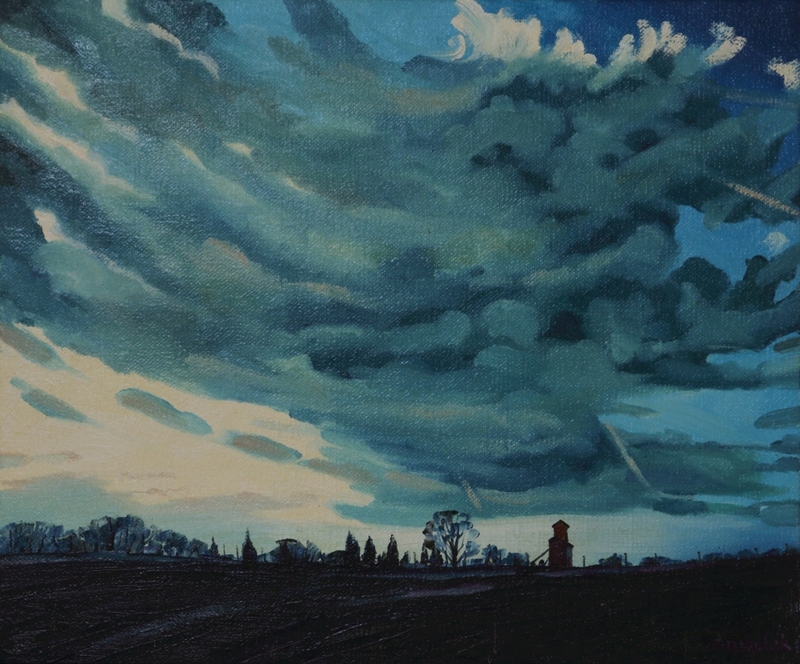 Looking west from Schomberg in December 1989 at a bank of stratocumulus. The distant horizon just gets lost in the clouds! Stratocumulus clouds are intrinsically linked to the earth. Interchanges of heat and moisture and momentum between the atmosphere and the soil are further complicated by terrain induced upslope and downslope effects. Heating from the sun over a variable surface further complicates the lowly stratocumulus clouds. One meteorologist I know referred to stratocumulus as garbage cloud unable to grasp the information available from the various cloud shapes. In fact there is much to be learned from observing this lowly but beautiful cloud. One just needs to keep an inquiring mind open to all of the possibilities. There were no housing developments in 1989. I had some time to paint. This was the sunset from Tuesday January 16th, 2018. Ontario was in the midst of a cold spell with fresh Arctic air being directed southward fresh from the North Pole. 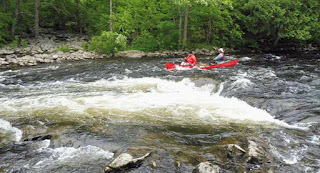 At one time the open water of Jim Day Rapids could be measured by just a few square metres. The flat and wavy tops and bottoms of the altostratus cloud revealed the strong northerly winds. Even the colours were cold. The inclusion of Tuesday in the title was meant to be a bit humourous since the day of the week has nothing to do with the appearance of the sunset. The month might give the season away and reveal a bit about what type of sky to expect. Regardless I thought that the sunset was beautiful and this led me to think of the old rythme about Tuesday's child being full of grace. I had fun with lots of oil on the slippery surface. The surface type greatly influences the feel of the oils. At one time I signed my name large like my mentor Mario Airomi. Over the years I have changed that so that my signature is only an inconspicuous portion of the art... often scratched in the thick and wet oils with a stick, tooth pick or nail. The art really needs to be more about the quality than the signature... just my opinion though. 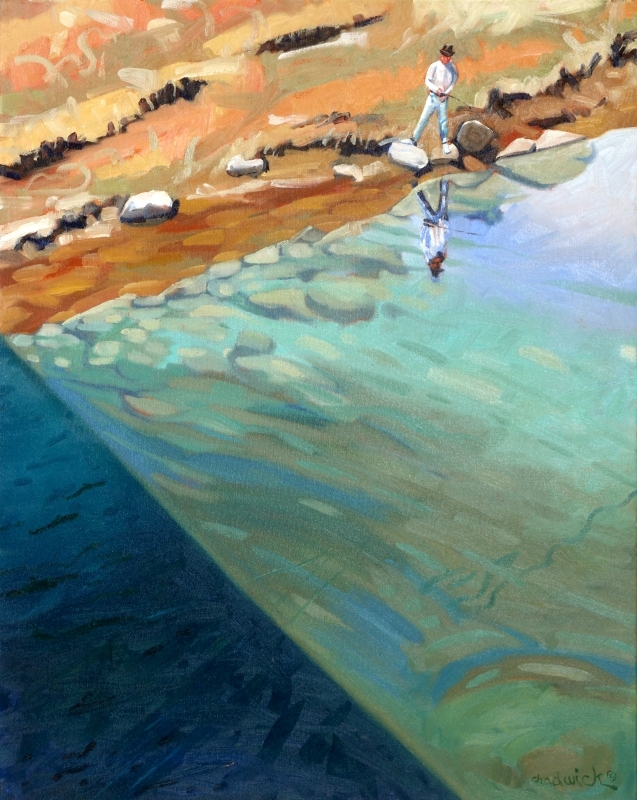 This is based on #1788 "Mattawa Morning". Seven modern, white water canoes were following the down-current path of the historical voyageurs in early June 2016. There was lots of water to make the rapids passable. The boulder fields at the low water outlet of the rapids did provide a few obstacles but we made it through unscathed. Two hundred years ago there would have been much more traffic on this water highway. It would have been the only route into the heart of the new land. We were virtually alone in 2016. 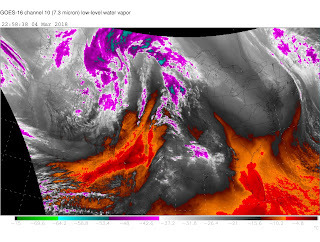 It had rained hard the previous night but cold air mass stratocumulus and remnants of fog and stratus were a welcome shield from the blazing sun of the previous few days. My goodness, this was a fun trip that was full of irreplaceable memories. I just had to record it in oil only hoping that some of the feelings would make it into the pigments. Art is more than tone, colour and shapes. You need to get the rhythm and emotion into the brush strokes which is something that the camera has a challenge with. Started 2 pm Friday February 2nd, 2018 - Ground Hog Day and I did see my shadow. It was sunny outside but the cold northwesterly winds and the resulting windchill countered the effects of the direct radiation. I was looking for a happy memory to enlarge. Perhaps the joy of a small panel can be made raptuorous when turned into something big. 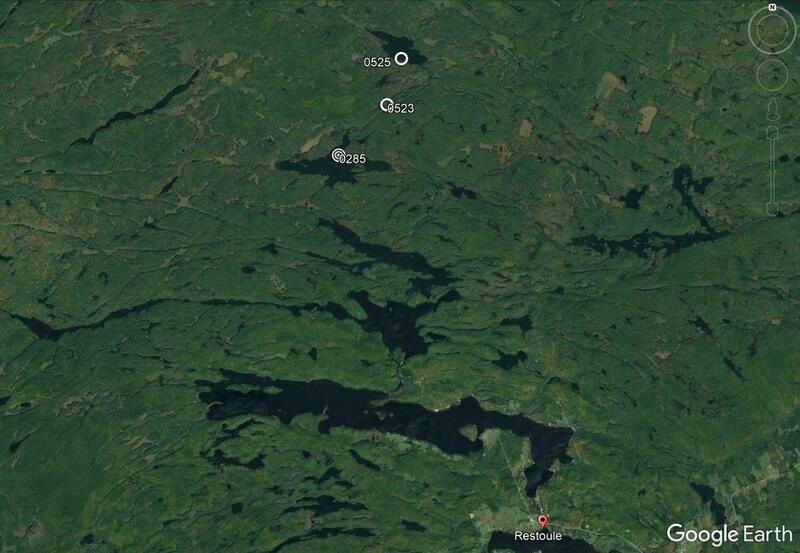 I had just set #2067 "Big Joe Mufferaw Pines" aside so I was in the Mattawa groove. I just stumbled across this pleasant memory. It must have ben destined to happen. It certainly was not planned. Cross your fingers and your paddles. Outward Bound is an organization with the mission to cultivate resilience, leadership, connections and compassion through inspiring and challenging journeys of self-discovery in the natural world. They were active when I was in university and I wish that I had participated in some of their canoe trips. It is never too late. #2069 "Flooded Land Wood Duck Drake"
I have several trail cameras around the Singleton property. It is interesting to see what is enjoying the forest and lakes with us. This particular camera was set about four feet above the ground on a trail that I suspected was frequented by the bobcat and wolf. I was even hoping to get a glimpse of the cougar that was reputed to be in the area. The spring flood of 2014 almost drowned the camera. I did manage to get some nice images of some very relaxed and content ducks. This wood duck drake was probably born in one of the twenty wood duck houses that are scattered around the wetlands. The flooded wetland floated several large logs and changed the landscape for a while. Ducks, turtles, frogs and a host of other creatures used these logs to bask on. I used a lot of paint on this particular canvas. This is a large version of #1826 "Stern Seat". I was working very hard on #2069 "Flooded Land Wood Duck Drake" and worried about stroking it to death. The best way to avoid overkill is to just start another canvas. I had this idea waiting in the wings and plus it was spitting rain outside on a winter day. It is an unusual composition and sadly beyond the experience of many. I am hoping that it connects with a few and that is enough for me. Let me explain the title. I am not fond of injections or needles. I don't "cry" but I do go to my "Happy Place" which is the stern seat of my canoe. The location of the specific waterway in my mind's eye doesn't really matter but I certainly do have my favourites. From the stern seat I can paddle the canoe silently almost anywhere and you would be amazed at what you can find and see along the way. This old canoe leaked when I put it in the water. My carbon "Margaritaville" canoe was on top of the car but it was a privilege to take this antique canoe for a spin around Buck Lake of the Limberlost area just west of Algonquin. 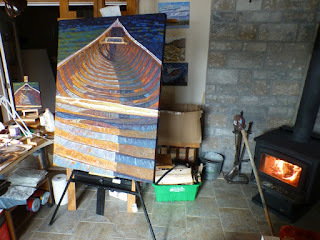 The water filled up the low sections of the cedar strip canvas canoe. The water would occasionally overflow one of the cedar strips and into the next low area - the same process that gradually filled all of the hull sections in the Titanic. I was in no danger of sinking and the water was still warm anyway. There are a lot of hidden meanings here. The stern seat was empty. I was paddling from the bow seat and looking backward. The antique cedar strip canoe was symmetric so this is the typical manoeuvre to paddling a longer canoe solo. It was windy in the main portion of Buck Lake so I needed to shift my bulk to the middle side on several occasions in order to keep the canoe stable and going forward in the direction that I wanted to go. It felt good to paddle the old cedar canoe. It had a lot of character. 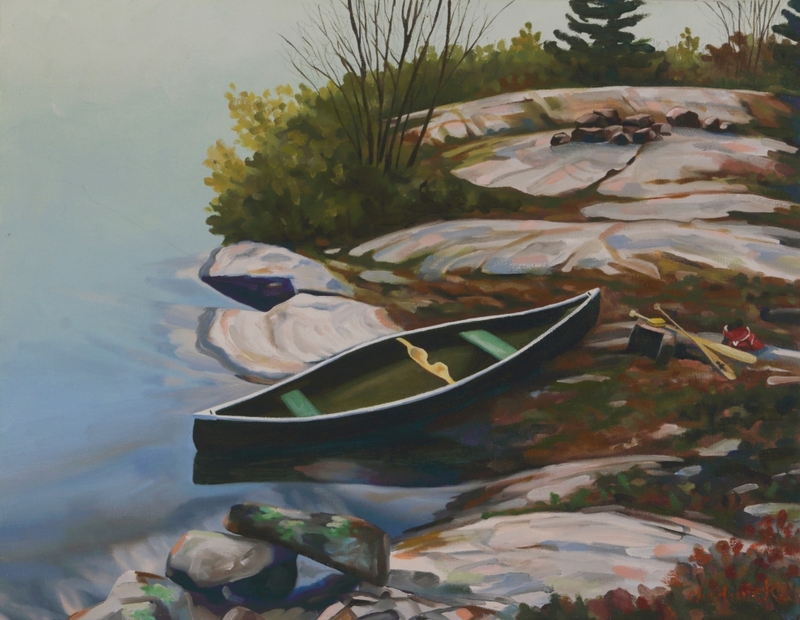 I would much prefer to have the seat in the back empty than have a stern person anywhere in the same canoe with me. There is a Yin Yang side to this painting. One side was in shadow even with the midday sun. The lower solar elevation still put the starboard side of the canoe in the shade. I was paddling easterly. 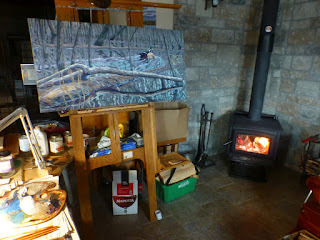 The light lit up the layers of old varnish covering the old cedar strips. This is an unusual composition for me as I paddled into and through the vegetation in a shallow part of Buck Lake. I felt that I could push through the weeds and get to the deeper water on the other side. I was on my way to the outlet of Buck Lake. A very involved title for a triangular-ly composed painting. It needs an explanation for sure. Keith and I were spring fishing for steelhead upstream from Meaford along the Bighead River. We typically catch a fish or two. I was on the bridge, which is responsible for the large triangular shadow, and Keith is casting downstream with a slow retrieve of a "skunk" flatfish. There are at least 4 and possibly 5 steelhead in the painting, headed upstream. They are very hard to entice to strike but when they do, they are like horses on the end of a light lead, racing all around. Keith caught a 12 ponder just down from this location. In younger days, the kids were always with me so much that they were my shadow. Keith was once again a bit of a teenage shadow on this weekend. I did an earlier painting called "Me and My Shadow" of Keith and this title is a bit of a pun on it and was named for the same reason. 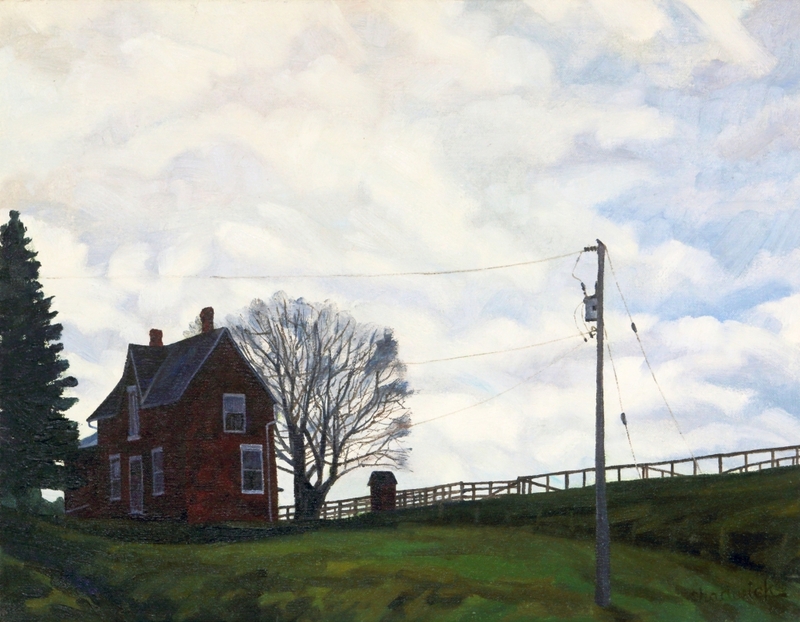 It also means simply "Meaford Shadow" since the key element in the painting is the shadow and we are, after all, very near Meaford. If you dissect the name though, it can mean "Me at the Ford". The ford of the river is of course the bridge and the bridge is casting the shadow in the painting. It is a very involved title for sure and I hate to explain it but no one would ever understand otherwise. This is another unique white birch tree at the King City Radar site on the same January day in 1990 as "Grey Day Beech" (#0242) and "The Birch" (#0239). 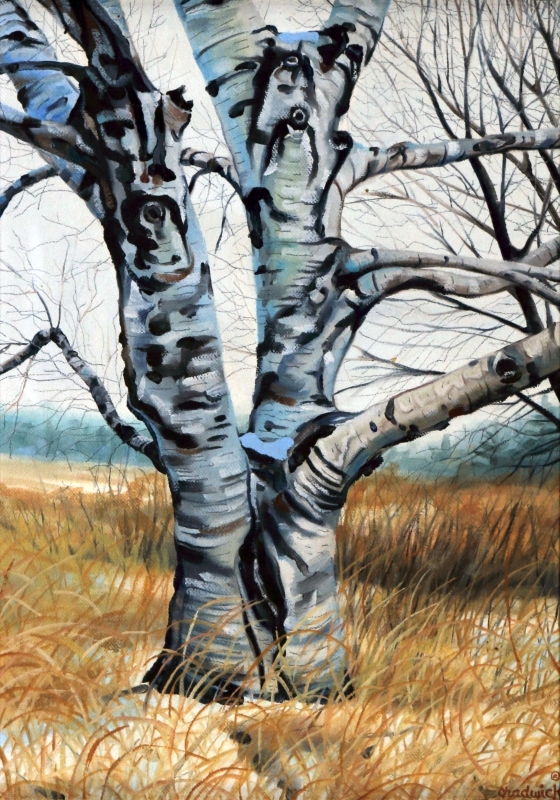 The white birch is also known as the paper birch or canoe birch. Every tree is an individual with a story to tell even though they do not travel much and put down roots very early in their life. The birch is a pioneer tree species that can colonize open fields like the King City Radar site. Mature paper birches within mature forests are rare as they are overcome by the more shade tolerant trees as secondary succession progresses. Birches like colder climates and do not survive the heat very well. A strong, flexible white birch tree can live for 80 to 140 years. Trees in colder climates can last a hundred years and I presume that would include this tree and the white birch in the Mowat Cemetery. The wood of a birch tree is flammable even when it's wet making it a good starter fuel for campfires in all kinds of weather. The white birch is known by the celts as Beith (pronounced 'bay') and is the symbol of new beginnings, regeneration, hope, new dawns and the promise of what is to come. 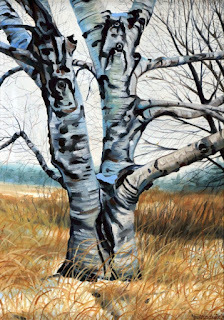 The birch tree carries ancient wisdom and yet appears forever young. White birch prefer well drained and dry soils. 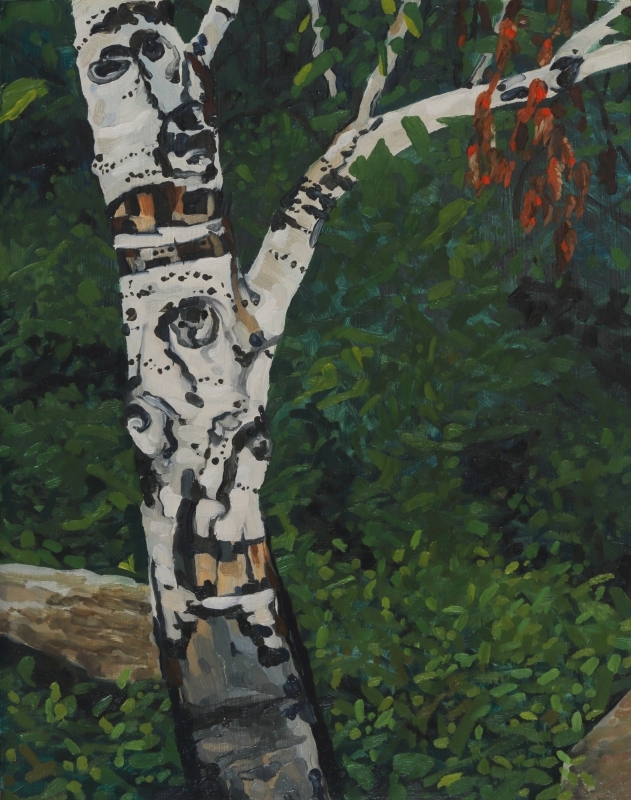 It is a medium-sized deciduous tree typically reaching 20 metres (66 ft) tall with the largest white birches reaching to 130 feet (40 m) with a trunk up to 30 inches (76 cm) in diameter like the one I painted. Trees in a more open landscape like this one tend to develop multiple trunks with branches close to the ground. Trees within a forest are more likely to be straight with a single trunk. The yellow leaves of autumn had already been stripped from this very exposed tree on the Doppler Radar site.